5000VA line interactive UPS system for server, network and telecommunications equipment. 5kVA UPS with internal batteries installs in only 3 rack spaces with a depth of only 635mm / 25 inches. High 98% line-power efficiency rating reduces energy consumption and BTU heat output. 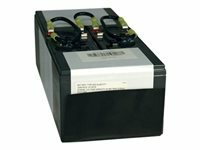 Expandable battery runtime with optional BP48V24-2U (limit 1), BP48V60RT-3U (multi-pack compatible) and BP48V27-2US (multi-pack compatible) external battery packs. Uninterruptible Power Supply (UPS) switches to battery-derived AC output during power failures and extreme voltage variations. Line interactive Automatic Voltage Regulation (AVR) offers voltage boost during brownouts and voltage reduction during overvoltage conditions to maintain regulated 230v output over an input range of 170-282V. Supports hardwire input. Includes C19 and C13 output receptacles. Network-grade AC surge and noise suppression. Network management interfaces support communications via USB, DB9 serial and SNMPWEBCARD slot. Supports simultaneous detailed monitoring of equipment load levels, self-test data and utility power conditions via all 3 network interfaces at once. Includes PowerAlert monitoring software and complete cabling. Emergency Power Off (EPO) interface. 3-stage metered current monitoring and battery charge status LEDs. Utility power and voltage regulation LEDs. Audible alarm. Self-test. 4-post rackmount installation accessories included; 2-9USTAND tower kit and 2POSTRMKITWM two post rack mounting accessories available. Field-replaceable, hot-swappable internal batteries and external battery packs.